Click/tap here to find the best Acworth, Georgia pilates studio for your needs! Classical and contemporary Pilates instruction. Certified for barrel, chair, mat, tower and reformer training. Voted Best Pilates Studio ATLANTA CITISEARCH 2010, Stability Pilates and Physical Therapy provides a wide range of services, including one-on-one physical and occupational therapy treatments by fully-licensed physical and occupational therapists, private and group Pilates instruction by STOTT PILATES-trained professionals, yoga classes, and massage appointments. We are easily accessible from metro Atlanta. 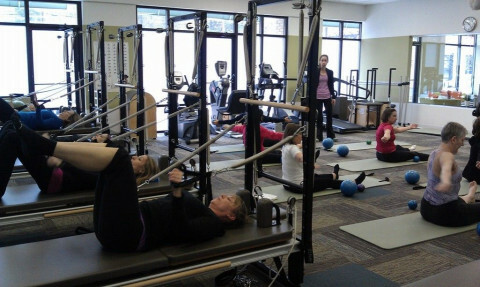 Experienced classic Pilates teacher with over 30 years in the fitness industry offering personalized instruction on the Reformer and mat as well as additional equipment. Back 2 Motion Physical Therapy provides the most comprehensive and superior level of rehabilitation services in Atlanta, with in-network accessibility &ndash; filling the gap between patient need and affordable care. The core of our philosophy is evaluating the whole person while focusing on the area of injury with the ultimate goal being total body wellness. Our specialized team of physical therapists is at the top of their profession. Our staff obtains the highest level of training and continuing education available so we can provide patients the superior care and treatment they deserve. Areas of specialization include: Manual Therapy, Pilates, Sports Medicine, Spine Rehabilitation and Redcord Neurac. Back 2 Motion Physical Therapists additionally collaborate with Atlanta’s preeminent physicians, chiropractors, massage therapists, personal trainers, and others, to create a unified approach to rehabilitation.